Whoever said that all great things cost too much, must’ve never shopped at sale; and GKB Opticals definitely knows how to pamper their customers. 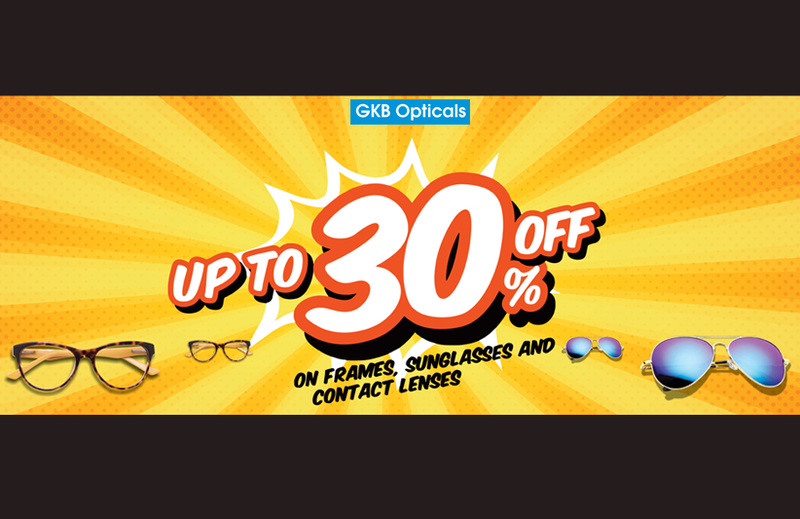 So, this season, you can get the best of the eyewear from international brands at a fraction of their original prices, courtesy the Upto 30% off at GKB Opticals. There’s no need to ask cousins to bring you branded eyewear from abroad, when you can get authentic and latest branded eyewear, easily without even getting up from the sofa? There are so many stylish spectacle frames brands available at GKB Opticals that it makes it easy to get the latest designs of eyewear online, so buy eye frames online at GKB Opticals and enjoy Upto 30% discount on the best collection of eyewear. The option to buy spectacles online India provides so much comfort to people, who are too lazy to go out to buy their eyewear. As well as there are various options for premium spectacle frames for all ages and all face shapes. Whether you are looking for reading glasses in India or computer glasses in India you will definitely find very few places like GKB Opticals where you will get hundreds of options for your specific requirements. With over 60+ brands available and at varied price ranges, there’s one for everyone. The branded eyewear collection of sunglasses for men and women in India at GKB Opticals is also huge. There are a number of people who love wearing stylish sunglasses but hardly get the options to get stylish branded premium sunglasses easily at their choice, but with GKB Opticals it is now possible to get branded sunglasses for men in India easily with the access to premium branded sunglasses at the best discounted prices. There is always the option to get the latest ones at the best prices. The stylish sunglasses online deals are available at great prices and these can be ordered from your phone or laptop/desktop with a few clicks. It is now so much easier to access the desired eyewear deals with just a few clicks with GKB Opticals online. Getting prescription sunglasses India customers know used to be quite a task, but now it’s so much easier. There is a need to understand that the branded eyewear in India from international brands are available for the best prices and can be found at most GKB Opticals stores across India. So, order today and make use of all the latest collection of sunglasses and eyeglasses from international brands at your fingertips, order online.